Inside a nondescript warehouse in uptown Cincinnati—a building that once stored barrels of ink—tomato plants rise toward the lights above. The tomatoes are more than 10 feet tall, narrow and slender, needing to be tied to and interwoven with the strings that stretch floor to ceiling. And, they are loaded with cherry tomatoes. These plants will live and produce fruit for as long as 12 months. 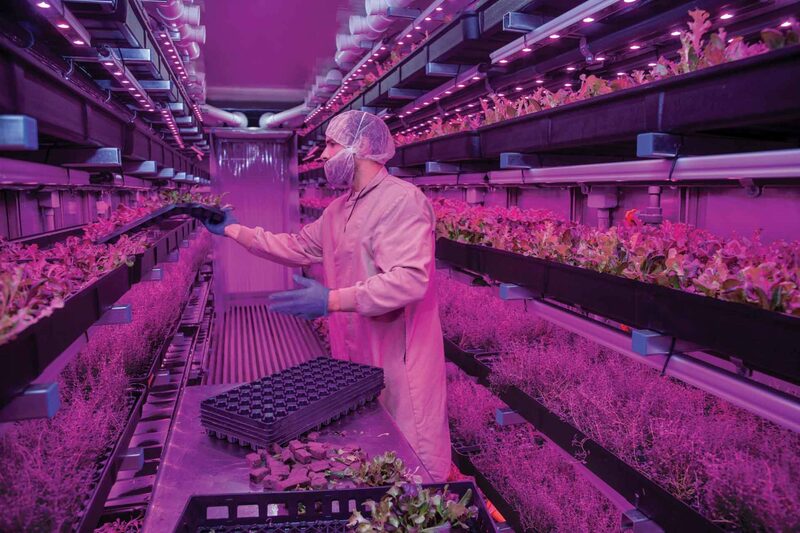 The light in the room is eerie, a spectrum of blue and red light that, to the eye, is nothing resembling sunlight, but such is the world of vertical farming. It’s a new era in agriculture—no soil, no sunlight, growing vegetables with roots in nutrient rich water, and perhaps most importantly, they are grown in the community where the crops will be eaten. It is some of the highest tech farming you’ll find. This is one of the farms run by 80 Acres Farms (80acresfarms.com), a firm started three years ago and growing rapidly—but growing carefully. The Cincinnati location is just one of its farms. With a growing space of one-fourth of an acre, the facility here can grow what normally would take 80 acres—the inspiration for the name. The company has other farms in Alabama, North Carolina, and Arkansas. Hydroponics, growing plants with no soil, is not new, but advances in technology have led to a booming change in this form of agriculture. Vertical farming, known as Controlled Environment Agriculture, is seeing a rapid surge with vertical farms popping up all over the world. 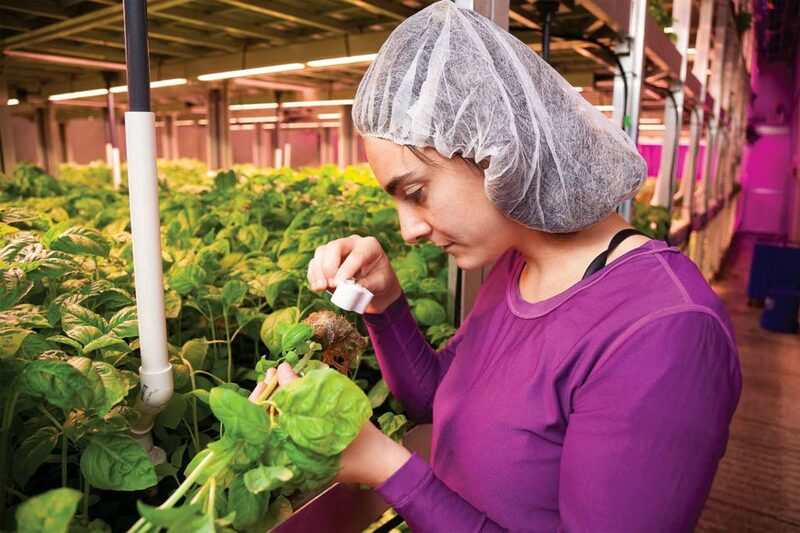 In just a few years, such farms have started in Chicago, San Francisco, Seattle, New York. AeroFarms in Newark, New Jersey, claims to have the world’s largest, with 70,000 square feet holding high layers of trays of plants. The company claims it can be 390 times more productive per square foot than in a conventional farm field. The biggest change is in LED lighting, bright bulbs that are highly efficient at producing light, emit no heat, and have dropped dramatically in price over the past five years. That and the growing demand for organic, fresh produce are giving entrepreneurs incentive to try this style of farming, even though setup costs are extraordinarily high. Farmhand Carly Holthaus uses a magnifier to inspect the root system of a basil plant. 80 Acres Farms uses a nutrient rich water, but what isn’t used by the plants is filtered and recycled . The demand for fresh vegetables is what Zelkind says makes the timing right for vertical farming. “The more delicate items like culinary herbs and leafy greens—things that don’t need to be shipped from California 2,000 miles away,” he says. “Stuff that comes from California, by the time you harvest, process, and ship it, the produce has a couple of days of shelf life and usually it’s disappointing. Despite the reduced prices for LED lighting, this is still not an easy way to begin farming. The costs to start up are enormous, and the method is not without its critics. Despite the increased efficiency of LED lighting and the reduced acreage requirements, the carbon footprint remains high. 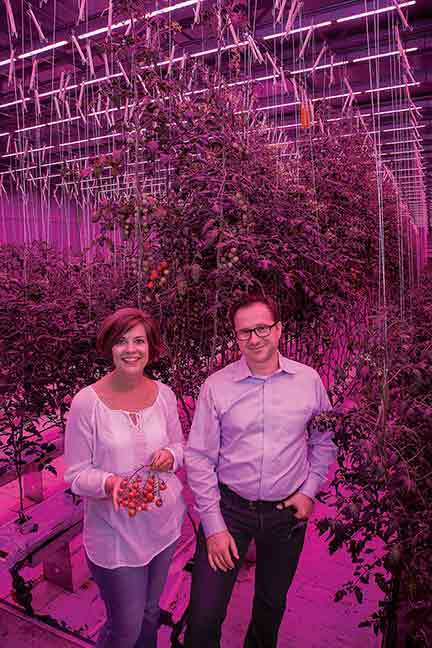 Tisha Livingston and Mike Zelkind, co-founders of 80 Acres Farms, have vast experience in the food industry, previously working with farmers and handling food marketing for large corporations. But the freshness of the produce—harvested one morning, eaten locally that afternoon—is a huge marketing advantage. And there are environmental advantages. The plants are grown with 97 percent less water than field-grown crops. No pesticides are used. There is no runoff as all the water and nutrients are recycled, filtered, then used again. “We don’t believe any single company will be the sole winner,” says Zelkind. “We think there’s going to be lots of companies that will eventually be successful doing this.” Where he and co-founder Tisha Livingston believe they have an edge is that they understand the food business, both having years of experience in the food industry and in understanding food markets. The company has just broken ground on another farm, 40 minutes away in Hamilton, Ohio, and it will have an even newer twist. Most of the work—the planting, the harvesting, the packaging—will be done by robotics. For years, futurists have been saying this day was coming. Do a Google search for vertical farming and you’re bound to find some illustrations of futurists’ visions: space-age skyscrapers that grow food. We’re not there, but who knows what the future holds? The sky just might be the limit. Renovating or replacing windbreaks can pay.